Under colonialism, Zambia (as Northern Rhodesia) experienced a copper mining boom in the 1920s, resulting in urbanisation around the northern copperbelt towns, a demographic pattern that continues into the 21st century. Since independence in 1964, Zambia has seen relative political stability. From 1972 to 1991 it was a one-party state, and experienced economic decline linked to its reliance on copper. After 1991, when Zambia saw a transition to multi-party politics, it has experienced a period of economic reform and growth that has stabilised the economy and reinvigorated foreign investment. Zambia’s reliance on its copper resources dominates its economy. As a landlocked country, it relies on transport links with neighbouring countries, and borrowing to support transport development in the 1970s and 80s, combined with low global copper prices, led to significant debt. Rising world copper prices in the 2000s, combined with economic reform internally, has seen Zambia’s economy improve in recent years, but it remains vulnerable, and the government is making efforts to diversify the economy by promoting other economic sectors including agriculture, tourism, gemstone mining and hydropower. Agriculture, although the biggest employer of Zambians, currently contributes relatively little to GDP, but this is increasing slowly, particularly due to a strengthening of the commercial farm sector with exports of crops such as tobacco and corn. Hydropower, based on dammed surface water reservoirs, is a key part of Zambia’s energy mix, but poor rainfall (e.g. in 2014-15) and low reservoir water levels have led to energy shortages. Zambia continues to suffer from poor health statistics, including a high HIV/AIDS infection rate of 17%. Zambia has extensive surface water resources, with a number of large perennial rivers. The major dammed surface water reservoirs are used primarily for electricity, but also provide water supplies. Much of the population relies on groundwater for domestic water supplies, both directly and via urban municipal water supply schemes, and groundwater is also used for irrigation and livestock watering. In recent years there has been an increase in drilling private water supply boreholes, including in urban areas, which is leading to concerns about local over-abstraction. The government are actively working to improve water management through improving regulation, understanding and management of the resource. with additional information from Ms Adjoah Parker, BGR, Zambia. Please cite this page as: Nkhuwa, Kang'omba, Chomba, Crane, Upton, Ó Dochartaigh and Bellwood-Howard, 2018. Zambia. Map developed from USGS GTOPOPO30; GADM global administrative areas; and UN Revision of World Urbanization Prospects. For more information on the map development and datasets see the geography resource page. 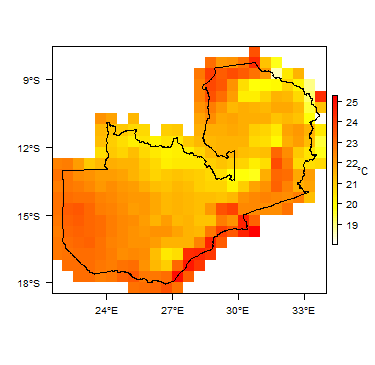 More information on average rainfall and temperature for each of the climate zones in Zambia can be seen at the Zambia climate page. River flow gauging is undertaken by Zesco, Zambia's power generating company, and the Zambezi River Authority (ZRA). Zesco's gauging stations are mainly on the Kafue River, while the ZRA gauges the Zambezi and stretches of the Kafue. Major surface water features of Zambia. Map developed from World Wildlife Fund HydroSHEDS; Digital Chart of the World drainage; and FAO Inland Water Bodies. For more information on the map development and datasets see the surface water resource page. 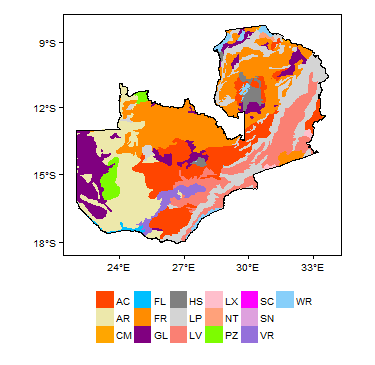 Soil Map of Zambia, from the European Commission Joint Research Centre: European Soil Portal. For more information on the map see the soil resource page. 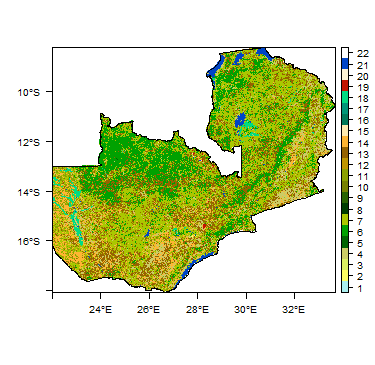 Land Cover Map of Zambia, from the European Space Agency GlobCover 2.3, 2009. For more information on the map see the land cover resource page. This section provides a summary of the geology of Zambia. More detail can be found in the references listed at the bottom of this page. Many of these references can be accessed through the Africa Groundwater Literature Archive. More information on the geology of Zambia is available from the Geological Survey Department (GSD), including a higher resolution national geological map at 1:1 million scale. Geology of Zambia at 1:5 million scale. Based on map described by Persits et al. 2002/Furon and Lombard 1964. For more information on the map development and datasets see the geology resource page. Mainly older Precambrian Granite Quartz veins. This section provides a summary of the hydrogeology of the main aquifers in Zambia. More information is available in the references listed at the bottom of this page. Many of these references can be accessed through the Africa Groundwater Literature Archive. Zambia is also covered by the SADC hydrogeological map and atlas (2010), available through the SADC Groundwater Information Portal. Low yielding weathered and/or fractured aquifers with limited potential, which are largely in the Basement complex, and some in igneous rocks. Alluvium (Quaternary) Direct recharge from rainfall, and recharge from rivers. Kalahari Group (Tertiary) This aquifer comprises 20 to 40 m of unconsolidated sands, which are usually unconfined. Flow and storage are intergranular. The water table is usually at a depth of about 10 to 20 m below ground surface, but sometimes is as much as 30 m deep. Yields of 0.2 to 5 l/s are obtainable. Sometimes brackish. Largely direct recharge from rainfall. Upper and Lower Karoo Groups Sandstones in the Karoo sequence form high porosity, high permeability aquifers. Most groundwater flow is in fractures but there is significant intergranular flow. The aquifers are typically unconfined, but occasionally confined.The water table is often between 15 to 20 m below ground surface. Yields of up to 15 l/s are possible. Shales, mudstones and other fine grained lithologies in the Karoo sequence typically form low productivity aquifers, with yields of 0.2 to 2 l/s. Sometimes fresh, but in most cases brackish. Direct recharge. Katanga Supergroup: Kundelungu and Lower Roan Quartzites; Muva Supergroup Other formations in the Katanga Supergroup, including the undifferentiated Kundelungu and Lower Roan Quartzites, and the formations of the Muva Supergroup, typically form locally productive aquifers. Yields typically between 0.1 and 10 l/s Direct recharge through fractures. This aquifer is composed of crystalline basement rocks, mostly granitic, and sometimes gabbro and others. The aquifer properties of crystalline basement aquifers are controlled by the depth of the weathered profile (regolith) and the degree of fracturing of unweathered bedrock. Fractured bedrock alone cannot sustain usable yields without the storage capacity of the overlying regolith. The regolith is typically 10 to 15 m thick, but can be up to 30 m thick. Below this, the unweathered bedrock can be fractured to depths of about 60 - 70 m (United Nations 1989). The water table is usually 20 to 30 m below the ground surface. Boreholes tend to be 50 to 60 m deep. An average transmissivity value of 5.7 m²/day is given. Yields are typically very low to low: between 0.2 and 2 l/s. One study reported the average yield from 106 boreholes to be 1.4 l/s, with 44% of the boreholes yielding less than 1 l/s and just 3% yielding 3 l/s or more (United Nations 1989). Yields are typically low to very low: 0.2 to 2 l/s. Sometimes acidic but in most cases neutral Recharge is influenced by geomorphology, thickness of regolith, and depth to groundwater table. High rates of urbanisation that exceed infrastructure development, which usually leads to low access to safe and adequate sanitation; and uncoordinated and unsatisfactory sanitation developments, and a consequent risk of groundwater pollution by uncontrolled sewage waste. Microbiological contamination is a widespread problem in urban areas and particularly affects shallow groundwater points. Growth in water demand, especially for agriculture and hydropower. Groundwater quality can also be threatened by intense rainfall events, resulting in flooding, which is becoming more common because of climate change. There is a risk that worsening groundwater quality might increasingly undermine groundwater's important role in the country’s economic development. A brief summary of the groundwater quality in Zambia is provided by Smedley (2001). 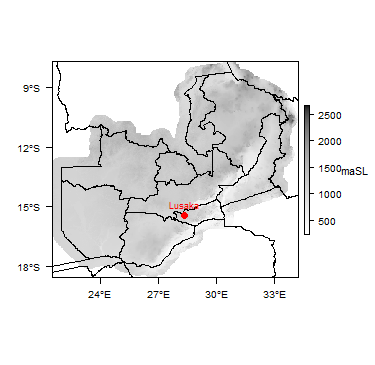 This indicates that groundwater in Zambia usually has very low concentrations of dissolved constituents (total dissolved solids concentrations are typically less than 200 mg/l). The main pollution problems are expected to be associated with metal mining, which can lead to increased concentrations of trace metals such as copper, zinc, chromium, nickel, cadmium and arsenic. Urban and agricultural areas may be impacted by nitrate and other anthropogenic contamination. Iodine deficiency has been observed in Zambia, particularly in the Northwestern, Western, Central and Southern Provinces, where some areas had goitre rates in excess of 50% (Bailey 1991), suggesting low iodine concentrations in groundwater in these areas. There is now legislation requiring all salt to be iodised (ICCIDD, 2012). Groundwater-surface water interaction is known to occur in valleys, where the groundwater table is shallow and in most cases, groundwater is discharging. However, there is a need for more in-depth knowledge of this interaction, in order to understand how groundwater discharge sustains flows in many perennial rivers and streams during the dry seasons. This knowledge is important for optimising conjunctive use of surface water and groundwater resources. The country’s biodiversity is protected by 19 national parks, 35 Game Management Areas (GMAs) and 488 national and local forest reserves (covering 8%, 22% and 9.6% of the country’s land area, respectively). All of these have many groundwater dependent ecosystems. The groundwater resource has greatly suffered from unregulated exploitation and exposure to pollution – aspects that may threaten it as an important source of water in the future. There is not yet enough data to make an accurate assessment of Zambia's groundwater availability and use. Personal experiences and estimates would put groundwater usage at about 60% – 70% of total national water supplies, although this is highly variable spatially. It is estimated that 12% of the country's irrigated area is irrigated using groundwater. Many farmers traditionally use dambos - wetland areas - for small scale groundwater irrigation. Groundwater is accessed from a variety of sources: boreholes equipped with electric pump, hand-pumps, windmills, solar pump, diesel pumps and rope and bucket. There are no recent statistics on the different pump technologies employed, but a nationwide inventory carried out by government in 1998 produced an estimated total of 11,000 boreholes (electric and hand pump) and 22,000 protected wells in the country (National Water Policy 2010). The BGR (Bundesanstalt für Geowissenschaften und Rohstoffe) — the German federal geological survey - have a role in technical support to WARMA in groundwater resources management and protection measures. The Water Resources Management Act of 2011, which stipulates that there shall be no private ownership of water and that any permission to use water will be time-limited. The Act provides for permits to drill and abstract groundwater, but these have not yet been implemented. The greatest challenge to effective (ground)water resources management in the country is posed by poor institutional and legal frameworks; inadequate water resources data and information systems; poor coordination of various ministries, departments and institutions dealing with water; centralised management of water resources; and lack of monitoring and evaluation of programmes and projects relating to water (National Water Policy 2010). The development of Statutory Instruments to regulate all water resources under the WRM Act of 2011 is currently underway and is expected to be completed by the end of 2017. There is some good information held on water points, including boreholes and wells, but it is fragmented across several institutions. For example, there is a well-organised borehole database for Zambia (GeODin©), which includes geological logs. This database was developed during a a project carried out by BGR through the Groundwater Resources Management Support Programme (GReSP), and is now managed and maintained by WARMA. Although a total of over sixteen thousand water points are in the database, there are still many, many groundwater points that have not been captured. There are also gaps in the quality of the data in the database — sometimes due to poor quality in the borehole reports delivered by the institutions that drilled the boreholes. For example, there may be missing geological or location (coordinate) information. This quality of borehole data is one of the many issues that the new Statutory Instruments aim to regulate. Groundwater level measurements are taken automatically at some stations in Lusaka on a daily basis, while in other places, these are read fortnightly. There is no national or regional groundwater quality monitoring. Zambia has two transboundary aquifers identified by the SADC Hydrogeological Mapping Project (SADC, 2010). The "Medium Zambezi Aquifer" crosses the border with Zimbabwe, and the "Sands and gravel aquifer" crosses the border with Malawi. More information about transboundary aquifers can be found on the Transboundary aquifers resources page. Many groundwater projects have been carried out in Zambia. Information on some major past groundwater projects, with web links to project results and outputs, can be found on the Zambia Groundwater Projects page. Many of the references below, and others relating to the hydrogeology of Zambia, can be accessed through the African Groundwater Literature Archive. Thieme JG and Johnson RL. 1974/75. Geological map of the Republic of Zambia. Geological Survey Department, Zambia. Ray AK. 1983. Lithostratigraphic succession of Zambia- under the recommendation of the Stratigraphic Committee, Geological Survey Department, Zambia; Lusaka. Bailey KV. 1991. Zambia: review of national IDD control programme. Summary of report to World Health Organisation/International Council for Control of Iodine Deficiency Disorders. IDD Newsletter, 7(3). Chenov C D. 1978. Hydrogeological Map of Zambia. UNESCO/National Water Resources Research Project, Zambia; National Council for Scientific Research, Lusaka, Zambia. ICCIDD. 2012. Zambia zeroes in on IDD elimination. IDD Newsletter, International Council for Control of Iodine Deficiency Disorders (Accessed from http://www.iccidd.org/newsletter/idd_aug12_zambia.pdf in May 2015). JICA-MEWD. 1995. National Water Resources Master Plan for the Republic of Zambia. Final Report – Main Report. Yachiyo Engineering Co. Ltd.
Lindahl J. 2014. Environmental impacts of mining in Zambia: Towards better environmental management and sustainable exploitation of mineral resources. SGU-rapport 2014:22. Geological Survey of Sweden. July 2014. Mpamba NH. 2006. 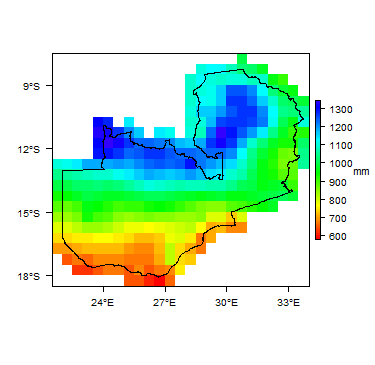 Comparative Analytical Model for Groundwater Monitoring in the Urban and Rural areas of Zambia – Groundwater Resources Data and Information. The University of Zambia, Lusaka, Zambia. Smedley PL. 2001. Groundwater Quality: Zambia. British Geological Survey. This page was last modified on 19 March 2019, at 15:57.